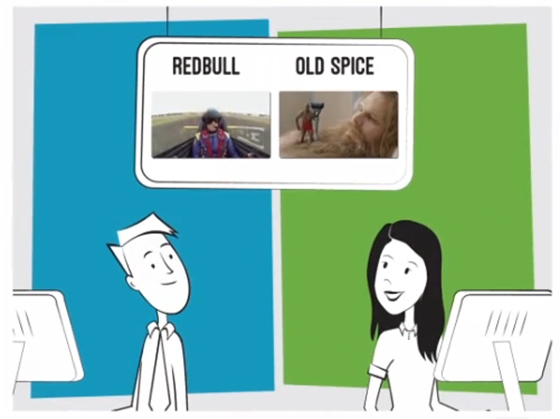 “They each saw the success of Red Bull and Old Spice and thought to themselves, “Well, wouldn’t that be nice?” Source: Tale of Two Marketers. You might be making cool videos, but if you’re like the majority of marketers, your cool content may have fizzled out and collected some internet dust – all without getting any clear metrics on your ROI. Don’t get me wrong, it’s great to release a video and feel like a total boss, but you’ll come down pretty fast from your marketer’s high when you realize that you had no real objectives for your video beyond brand awareness. Luckily, there is a way to use video to increase qualified leads in your sales pipeline and prove ROI. The trick to making your videos count is to build purposeful, measurable assets rather than random bursts of video action. With our latest campaign, the Tale of Two Marketers, we wanted to showcase the two kinds of outlooks people seem to have about video. We did this using a video storybook featuring two cartoon personas: Post-and-Pray Pete and Strategic Sue. As you press play, the storybook springs to life and you learn more about the cartoon marketers. However, in a twist ending, it turns out that Strategic Sue isn’t just a pipe dream of a marketer… she’s real. 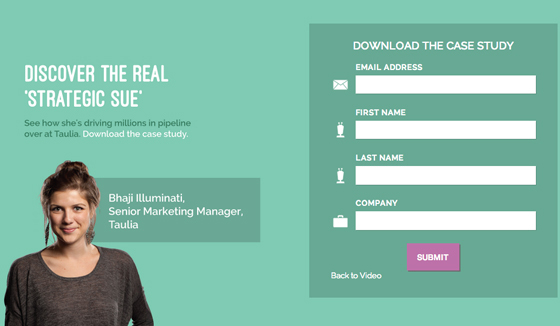 Her name is Bhaji Illuminati and you can download a case study featuring her awesome tactics if you fill out the contact form. Pretty neat, right? The best part is that this campaign – which was all about getting people to download the case study – converted at 33%! Not bad for the sort of content that would normally be left ungated and unmeasured. Here are some steps you can take to make sure your next video marketing campaign drives real conversions. With video marketing, one of the most important factors to consider is what you want your content to accomplish. Before writing your script, determine exactly what you want your target audience to do after watching your video. In the case of our campaign, we tied the entire thing to the release of our case study. This contributed to the whimsical twist ending and made the video lead to an end goal. We could ultimately evaluate the success of the campaign based on how many people followed through with downloading the case study. As a bonus, the video acted as a free piece of content to get prospects to give over their info in exchange for watching the video. Lead generation FTW. Remember: Only use one clear CTA, mapped to the goals of your video. Need some more inspiration? Here are six more examples of post-video CTAs. When you look around at top brands these days, everyone is becoming a storyteller. From Coca-Cola to Chipotle and Vodafone, brands are crafting online masterpieces around broad themes like happiness and community. Video magic starts when you elicit an emotional response with your content to drive a specific action, such as filling out a form or signing up for a demo. Good storytelling will jumpstart the emotions that lead to action. Laughter, fear, excitement and greed are all great motivators. Let’s say you choose to evoke anxiety to drive action. Your video might be about a software add-on your prospect doesn’t have. The protagonist is panicked upon realizing, “Oh no! I’m missing this critical feature! My competitors will crush me!”. Using the pain points of your audience, you can get viewers to take action – in this case, by signing up for a demo. By cleverly asking, “Do you know what your marketing is doing?” the brand forces you to consider your own strategy. The emotion you’re left with (anxiety eased by clever comedy) can drive you to check out their solution. When planning your video, always start by identifying the feeling you want your audience to walk away with and how your story will create that emotional response. Over 70% of marketers were unable to deliver on quantifiable results in 2013, so this year it’s time to get trackin’. After connecting your video to clear goals, look to video analytics to understand your performance. We found that within four weeks, the Tale of Two Marketers had over 2000 unique views and that viewers typically spent just over four minutes on the landing page. The video click-through rate (the percentage of those who landed on the page and clicked through to watch the video) was a strong 78%. Moreover, the piece holds 73% of our target audience right to the very end. The x axis on the graph below is the duration of the video and the y axis is the percentage of audience watching. 73% of Vidyard’s audience watched the video until the end. With a connection to our marketing automation platform, we were also able to see the overall “completed view to lead” conversion rate was 33%. For a case study that would normally be left ungated, the fact that we were able to use video to convert 33% of viewers is a huge win. By using a daily dashboard to report on our metrics, we could determine when organic reach was maxed out and whether/when the campaign warranted some paid promotion. Once we noticed we’d hit our peak for organic views, we looked into other promotional channels including paid media in outlets targeting our niche audience. The percentage of those who follow through with your call to action. All of these metrics indicate whether your video was a hit. Marketers connecting videos to Salesforce can even use automated reports to discover ROI generated per video asset! When embedding video on your landing page, it’s important to consider visual impact. If you’ve built out a whole video story, you’ll definitely want a dedicated campaign landing page. On the landing page, you can feature related text-based assets (like your related ebooks and white papers) and a social component – maybe a hashtag to start a conversation around your campaign’s message – but always showcase your video as the star. Our video was front and center (we used a bigger player ratio for maximum impact) and the CTA was super clear: “Download the case study.” The CTA also existed outside of the video player so that even if you didn’t get to the end to see the “real” Strategic Sue, you’d still have the option to take action. Finally, you’ll want to organize timely follow-up with those who engaged with your CTA. You can set triggers in your marketing automation or CRM system to notify you of various actions that your leads take, such as watching a certain percentage of your video. Additionally, you can set triggers to send a lead directly to sales, or even send automated emails encouraging engaged leads to view more related content, connect with you on social channels and more. You can read up on this type of targeted follow-up here. Video marketing doesn’t have to be a shot in the dark. If you find you’re always discussing a certain customer pain point, or using the same pitch to describe your product or services, scale your message with a memorable video story. And don’t forget to track your success with meaningful metrics.